What happened to my rights? Private companies issuing notices for additional parking payments are commonplace across the UK. Dundee is no different. One posted me a demand which arrived quite recently, a charge which The Courier reported how best to deal with. That aside, a second and more serious point of contention I have is that the DVLA have shared my data with a private limited company without my permission. Am I naive thinking the data protection act was designed so that my data couldn’t be sold, passed on or shared? I’d like to take this opportunity to advise the DVLA that I do not give permission for the DVLA to offer or sell my personal data to any privately registered company seeking to gain financial benefit from me in Scotland. I’d like to complain that I never consented to you handing out my personal details to any company. I’d like to make it clear I cannot consent to you doing so again without first asking me. If you do then I will have to consider the most appropriate way to challenge you handing out data you hold on me. You state in the online file Release of information from DVLA’s Registers that: “In all matters regarding data release the DVLA acts responsibly and in accordance with legislation.” I don’t believe in this instance where you shared my personal data with a private company that you behaved in a responsible manner, nor do I believe it’s in accordance with legislation in Scotland. I therefore disagree that the circumstances under which they were released were lawful. Under Scots Law only someone acting under the authority of Police Scotland or a local authority can currently issue such financial demands on drivers in the form of a fine. Sharing my data with a private company is neither permissible nor do I consider it to be lawful. As a result I’d also like to complain that, contrary to the commitment you set out in the afore-mentioned document, I don’t believe your actions are protecting my privacy as an individual motorist. They are, in fact, flagrantly breaching them. Your decision to share or sell my details on your database – I have no choice about them being there if I wish to drive in the UK, and seemingly no say in what you do with them – with a private company also breaches my rights with regard to data protection under Scots Law and the EU Charter of Fundamental Rights. As a result not only do I wish to make a complaint about the actions of the DVLA as cited but want to take this opportunity to serve notice that I intend to seek advice that may lead to legal action against the DVLA for adopting this approach against me, including seeking damages, compensation, costs and legal fees. 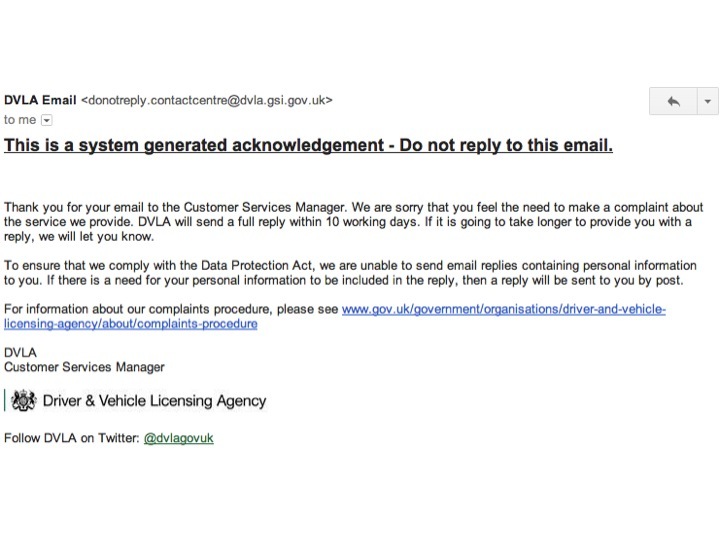 Having emailed this I then received an email auto-response claiming that the DVLA are unable to send email replies containing personal information to ensure they comply with the Data Protection Act. Parody. Will this make any difference? Will DVLA accept responsibility for what I consider to be wrongful actions and poor judgement? Time will tell. What I can guarantee is that I’ll be doing everything to make sure that my car never ends up in a certain Dundee city centre retail park, no matter who is driving it. Me, my car and my business and trade will be going elsewhere.